The Embassy of Colombia in Singapore has criticised a new local bar for taking on a Pablo Escobar theme. 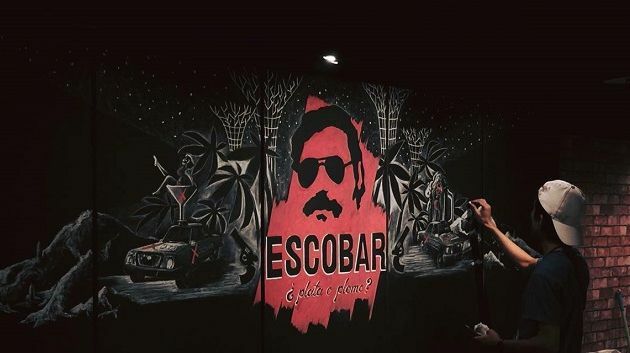 The bar, named Escobar, features murals dedicated to Escobar, a late Colombian drug kingpin also known as “The King of Cocaine”, and included themed-menu offerings such as “Don Corleone” pizza and “Stab in Your Heart” burger, Yahoo News reported. The embassy’s letter to the Ministry of Foreign Affairs said that idolising Escobar undermines the work done by successive Colombian governments, adding that the Colombian community in Singapore experienced “indignation” towards the issue. The embassy expressed unhappiness at the the bar being modelled after the Netflix TV series Narcos, as Colombia is no longer what the show portrays, according to Yahoo News. The letter also listed the crimes committed by Escobar, and expressed hope that the Singapore government would help to ensure the owner of the new bar will take steps to “reverse this harmful image”. The Central Narcotics Bureau (CNB) described the manner in which the drug kingpin’s name and image are being utilised to promote the bar as “highly objectionable”, reported TODAY, adding that it goes against Singapore’s zero-tolerance approach towards drugs and the government’s efforts in preventative drug education. The agency also called the glamorisation of Escobar and associated drug use “irresponsible” and “insensitive”. According to TODAY, CNB and the Singapore Police Force take the necessary means to uphold the anti-drug policy, and keep a close eye on the bar and its patrons to ensure there no illegal drug activities in that area. CNB declined to comment further on Marketing‘s queries. Marketing has reached out to the Embassy of Colombia and Escobar for comment. In his new role, Azar will focus investing resources to further the agency’s content and tech production capabilities. ..
GOVT Singapore has renewed its creative and brand duties with Pernod Ricard Singapore for a third consecutive year. ..
Carousell has rolled out a new integrated marketing campaign in Hong Kong, entitled “OhMy__”(“噢賣__”), with online videos, offline ..